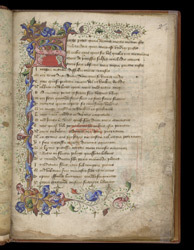 This manuscript contains a set of poems by James Nicholas of Denmark (he flourished c.1360-73) written in 1363 in honour of Aymer of Valence, Earl of Pembroke (d.1324), whose widow Marie was Nicholas's patron, and founder of Pembroke College, Cambridge. On a flyleaf it has a late medieval ownership inscription (partly erased) of the College. The first part of the manuscript contains poems about death, each using a different poetic form. The first is illustrated in the initial 'S' by a man in his deathbed, with an angel waiting at the foot. Typical mid 15th-century border ornament surrounds the text on three sides.